Full coverage, inside and out. Video surveillance can enhance the safety and security of your business. Not only can video surveillance detect and interpret events, it can reduce risk and increase the effectiveness of existing security systems. Vision's video surveillance solutions provide you with the comfort of knowing what's going on around your company and meeting your specific organizational priorities, while staying within the budget. What parts of your business could benefit from effective surveillance and monitoring? Surveillance systems benefit businesses by not only monitoring theft, but increasing staff safety and confirming incidents. With the knowledge that they're being protected, employees are more likely to feel safe. The portrayal of events provided by a surveillance system is also valuable for confirming incidents such as theft, work place violence, property damage and vandalism. This information is essential when suing for damages or reporting to law enforcement. But having a good surveillance system can bring benefits not just in terms of security and monitoring, but also in wider business operations and analytics. In industries such as retail, for example, the ability for surveillance systems to provide data and customer insights is changing the way that not only security departments work, but also marketing, customer service and IT departments, providing valuable insights to help vastly improve customer experience and profitability. For example, understanding how customers move throughout a shop is crucial to how products are laid out in the store and advanced features such as facial recognition can be used to estimate attributes such as the gender and age of shoppers. These capabilities can allow store owners to not only better understand the profile of their shoppers, but they also enable targeted advertising to be implemented to help display the most relevant products to their target market. The Importance of Video Surveillance - Security is imperative for any business. After all, how can you be profitable if you can't protect your assets? Simply put, knowledge is the key to success. Video surveillance provides a deterrent to the masses, sending the message that you are paying attention to what is going on in your establishment. Benefits of a Video Surveillance System - Before diving into the details, it's important to note the many benefits offered by a video surveillance system. Not only can surveillance cameras deter criminals and help law enforcement quickly catch any would-be thieves, but these systems can also improve the accountability of your employees, help you monitor productivity and sometimes even reduce your insurance premiums. 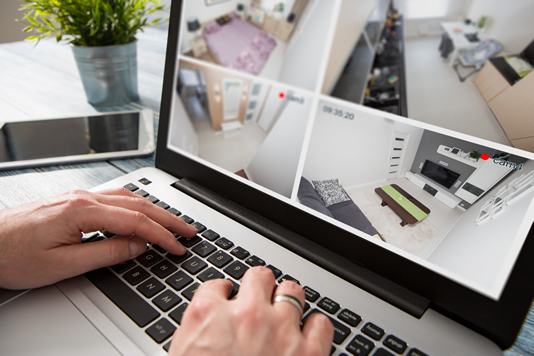 While the up-front costs of installing a video surveillance system can seem a little steep, the long-term payoff and the peace of mind may well be worth the expense. Application Considerations - What challenges do you want to overcome with video surveillance? Can analytics help? An effective system is essential, given that the average amount of time someone can focus on video footage is only 20 minutes. Built analytics can alert you to suspicious activity and apply analytics, improving the way you run your business. Built in motion detection and intelligent algorithms provide useful, actionable information, such as the total number of people that walk into an area. Compared against sales, retailers can assess the rate of conversion and the best times of day for promotions. After the Install - Once the system has been installed and training is completed, then comes the most crucial part. Someone needs to be in charge and the system needs to be checked, verified and maintained. There is nothing worse than needing to pull footage on an event just to find out that you do not have the footage for some reason. Have a process and work the process. Let people know that you do review footage. People respect what you inspect. Visual cameras on a building are a deterrent. But if your customers and employees know that you actually review footage, that is a game changer. How do I get started? - Like anything else, take it in small bites and have a plan with a clear outcome. Be very specific in what you need to accomplish and be realistic. Many times, when we discuss needs with a customer, they will say something very generic like, "I would like to have a complete overview of an area such as a parking lot." Then as we ask questions, it evolves into a desire for the same camera to have the ability to focus on a small object, like a license plate, or follow a moving object. All that is fine, but that will not happen with a single camera. Vision will help yo manage expectations by developing the correct design. Can't I just install my own? - We get this question quite a bit and we can understand why. Just because you can purchase a video surveillance system at a big box store does not mean you should. Not sure that it is a good idea to purchase a major business application the same place you purchase potato chips! To be successful in business, you surround yourself with professionals. Every business has an internal resource or a professional service for advice and direction on legal, financial, accounting, human resources and the list goes on. Make security a priority and treat it like you approach other key business solutions. Is scalability key? Will you need to add more cameras as time goes on? - Having a flexible and scalable surveillance system is important. The problem with traditional CCTV systems is that they are a closed circuit meaning that everything is hard-wired and difficult to scale. It is important then to choose IP cameras which connect over a wireless network allowing you to easily grow and scale any installation as you need. Adding IP cameras to a network works in much the same way as adding a phone to a VOIP network – it's simple and easy and there's no wiring to change or update. Is audio important? - Integrating audio into a surveillance system makes it possible for personnel to hear and speak with possible perpetrators. It can be easily integrated with video management systems. From a surveillance point of view, it can also be used as an independent detection method triggering recordings and alarms when audio passes a certain threshold. What are the lighting conditions? - It's important to test cameras to see which models work best in the lighting conditions present at your premises. Areas inside and outside will experience different amounts of sunlight throughout the day, not to mention throughout the year as seasons change. Thinking about where the light will be is vital. For example, will there be a reflection off the floor or window? Is there strong backlighting creating a glare? Thankfully, there are a variety of technologies which will ensure you capture usable footage in a range of lighting conditions. Light filtering technology such as IR filters and artificial illuminators can amplify or reduce the amount of light reaching a sensor, creating clearer images during the day and night. Do the cameras need to be discreet or act as a visual deterrent? - The location and what you need to monitor will determine whether obvious or discreet cameras are required. Box cameras can be some of the largest and most obvious, reminding people that they’re being monitored and reducing the chance of theft. Dome cameras are the best to use for discretion due to their small half spherical-shape – the ultra-compact models are so small that they can fit in the palm of your hand. Lastly, PZT (Pan Tilt Zoom) cameras are good for monitoring expansive areas and following subjects easily.